It is wise to consult the travel calendar and the online guides and check the temperature and climate before planning a trip to any coveted destination. That usually lessens the unpleasant weather surprises after reaching the unknown place. This makes travel less hazardous and much more joyful and hassle-free. While planning the travel tour and itinerary it is always advisable to give a brief look at the local weather and temperature conditions of the place and to go prepared especially when you are travelling with family. The Annual Tourism Festival held usually in the month of January each year might be considered a good time to visit the beautiful islands. The vibrant cultural festivities along with brilliant showcasing of various talents of the local artists and performers from far and near add charm to the already famed beauty of the archipelago. Andaman is usually very pleasant to visit during the winter months and the tourist season starts from October and continues till May. Andaman sees tourists almost all round the year. The captivating blue seas and the greenery of the mangrove coves attract tourists from all corners of the world all through the year. The waters in the winter might not be as warm but then snorkelling and swimming along with other water adventures sports continue with equal fervour. During the months of October and November and also in March till May, the waters are actually refreshingly warm and rejuvenating. The skies remain pleasantly sunny and bright and the climate is ideal for snorkelling and scuba diving, which are the main attractions for Andaman visit. The seas are flat and reflect the skies overhead joyfully in the crystal clear waters. Underwater visibility is near perfect which makes underwater activities a real pleasure. Temperatures in the various islands are never extreme and ranges between 23 degrees Celsius to 30 degrees Celsius. The April to June temperatures vary from 24 to 37 degrees Celsius. From May to September the temperatures dip a bit and hover between 22 and 35 degrees Celsius. In the winter months, the temperature ranges from 20 to 30 degrees Celsius. Thus the summer temperatures are pleasantly warm and the tourist hubs such as Port Blair, Long Island, Neil Island, Havelock, Clique Islands, Smith and Ross Islands, Little Andaman, Baratang and Diglipur see a lot of enthusiastic crowd. The tourists love to bask in the golden sunshine along the golden beaches and enjoy the refreshing seas and exquisite beauty of the islands and the eco-marine life. 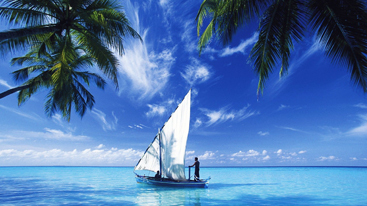 It is recommended that Monsoons are to be strictly avoided while planning a visit to Andamans. The high tidal waves crashing the shores, the incessant pouring rains and the typically strong winds might cause a lot of inconvenience to outsiders not familiar with the harsh climatic conditions of the otherwise mildly seasonal Andamans. Andamans is situated in the Bay of Bengal seas and experiences a lot of extreme tropical monsoon climate with strong winds causing cyclones and deep destruction to life and property of the islanders. The monsoon rage usually hits the islands of Andaman and Nicobar around late May and continues till middle of September. Low underwater visibility and disruption in all ferry routes are a common phenomenon. Most ferries do not ply or are very irregular during this time. The underwater adventure sports along with sea-plane ride, paragliding and parasailing are all cancelled till weather becomes suitable once more. So you would miss out on the major fun part of visiting Andamans during monsoons. Moreover, the rage of cyclones hitting the island in the recent past has become major reasons not to travel to these parts during the monsoons.